First things first: the competition. I used a random number generator to pick a winner and the lucky recipient of a copy of Yotam Ottolenghi’s ‘Plenty More’ is Saol San Gluten. Congratulations! This soup is one of the healthier recipes to be found on this blog. In fairness, after bacon jam almost anything would look healthy. ‘Eating clean’ seems to be the trend of the moment (so much so that someone emailing me about a flatshare listed it as a hobby), but it means different things to different people. For some it’s being vegan, for others it involves making conventional food with non-conventional ingredients, like sugar-free, egg-free, butter-free brownies and for some people it seems to involve putting chia seeds in everything you eat. I’m definitely more a fan of the Julia Child philosophy that you should only eat diet food while you’re waiting for the steak to cook. But sometimes, you need to eat a meal that feels a bit wholesome. I’ve been travelling a lot lately, eating all the best food London has to offer, and every fried thing Holland has to offer, and eventually something has to give. This is a nourishing, comforting soup from the Avoca Cafe Cookbook that is perfect for autumn. I have a tempestuous relationship with sweet potato. Sometimes I crave it, sometimes I find it sickeningly cloying. 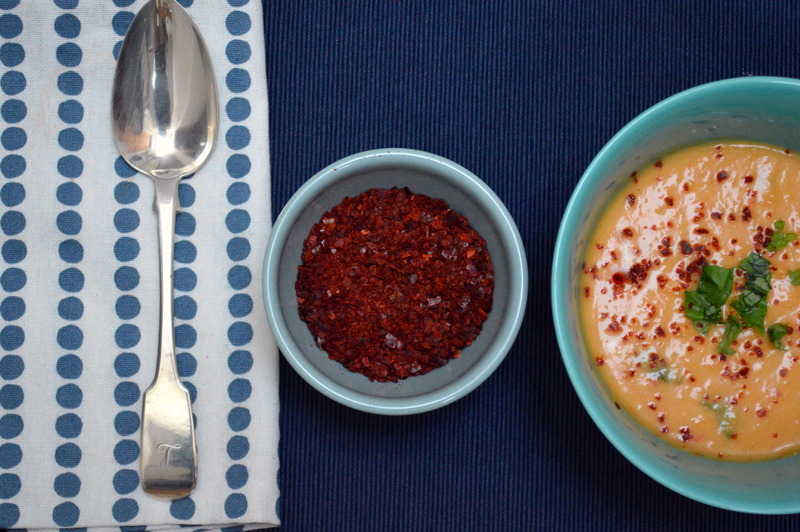 This soup strikes a good balance. The lime juice counters the sweetness and the fish sauce gives it an umami hit. It’s gluten and dairy free, but obviously not vegetarian. It’s quick to make and it freezes well. Toss with some oil and roast in an oven at 200C until soft and starting to brown a little, about 20-30 minutes. Meanwhile, fry the ginger,garlic and lemongrass in some oil for 2 minutes until fragrant. Add the leek and cook for 7-10 minutes until soft. Add the roasted sweet potato, coconut milk and stock and simmer for 5-10 minutes. Blend, and add the fish sauce, lime juice and chili flakes to taste (be careful with the fish sauce and add it little by little, it can get very overwhelming very quickly). This recipe is adapted from Claus Meyer’s ‘Almanak‘ an incredibly beautiful and varied Danish cookbook that makes me wish I actually could understand Danish. Claus Meyer is one of the founders of the New Nordic Cuisine concept who, along with Rene Redzepi, set up Noma. Meyer is a household name in Denmark, and his cookbooks have been on the shelves of every Danish house I have visited. His Ted talk on indigenous food cultures is well worth a watch. This recipe is pure New Nordic Cuisine. It is seasonal and relies on almost all local ingredients (although the original called for chorizo, we went for bacon instead since we already had it in the fridge). 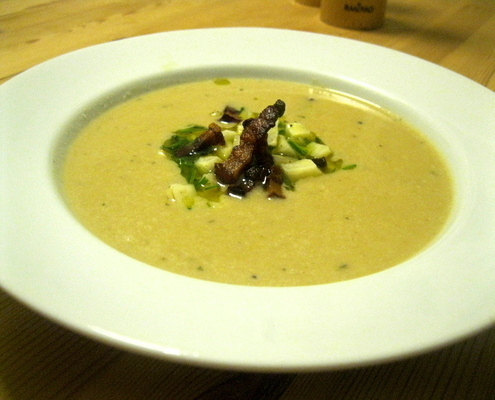 The marinaded raw artichoke and vinegar add a really nice edge and contrast to the silky soup. We only had a dark stock to hand, but if you can make this with a light chicken stock, it will turn out a beautiful ethereal creamy white. Serves 6 as a starter. Chop the onion and one garlic clove. Peel the artichokes and set two aside for the marinated raw artichoke. Roughly chop the remainin artichoke. Saute the onion in the butter over a medium low heat until softened, about 8-10 minutes. Add the garlic and thyme and cook for 1-2 minutes. Add the artichoke and saute for 5 minutes. Add the stock and cook for another 10-15 minutes until the artichokes are soft. Meanwhile to make the marinated raw artichoke, chop the artichokes into small cubes. Cut the garlic into identifiable slices and add to the oil and 2 tablespoons of vinegar. Chop in half the chives and add the artichoke, leaving to marinate for 10-15 minutes. Finely chop the bacon and fry until crispy, 3-4 minutes. Remove the thyme and blend the soup until smooth. Return to the pot, stir in the cream and reheat gently before serving. Remove the garlic from the marinaded artichoke. Season the soup with salt, pepper, nutmeg and a little bit of vinegar to taste. Serve topped with bacon, remaining chopped chives and marinated artichoke. As Summer seems to be rapidly bypassing Autumn into winter, soup is the order of the day. Chorizo features a lot in my recipes, as it is a very easy way to give a great boost of flavour to various recipes, and a little goes a long way. Serves 4 as a starter. Saute the onions on a medium heat until soft, approximately 4-5 minutes. Add the chorizo and cook for a further 3-4 minutes. Add the almonds, beans, paprika and stock. Cook for approximately 20 minutes, until the the liquid has reduced and flavours are blended. Blend with a hand held liquidiser or blender. Swirl in balsamic vinegar in each before serving. 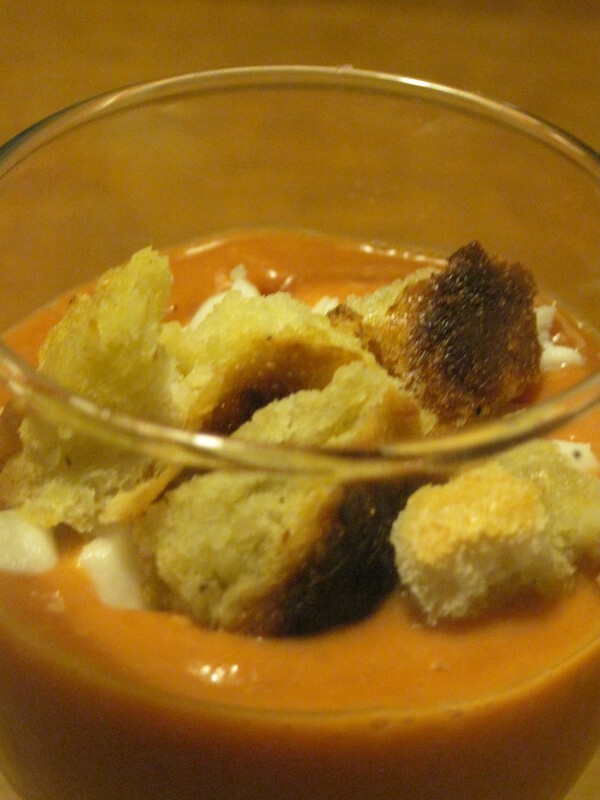 This my recipe for the traditional Spanish chilled tomato soup. It’s very refreshing for Summer, and pretty healthy to boot.It makes 4 starter portions or 2 lunch portions. Put all the ingredients except the croutons in a liquidiser, or blend with a hand held mixer. Push through a sieve to remove seeds and remaining skin. Chill for 2-3 hours, taste and season. Serve topped with the extra crumbled goats cheese and croutons.